Mirka's Abranet hand sanding starter kit 80 x 230mm is everything you need in one box. 5 Abranet strips (1 x Coarse, 3 x Medium & 1 x Fine). 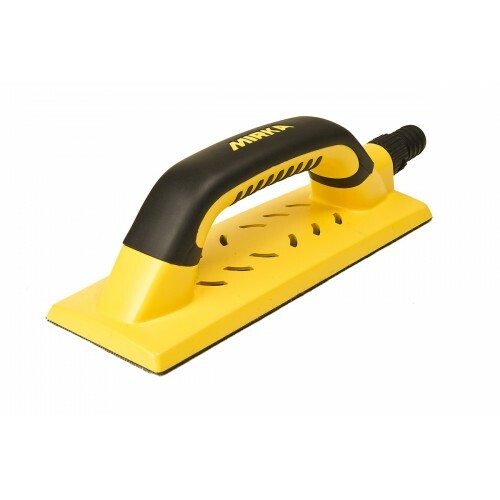 The eye catching bright yellow Handy by Mirka hand sanding tool has an ergonomic two handed handle with soft grip. Handy is equipped with holes on top for optimised dust extraction & air flow, which makes the Handy easy to move over the surface. Handy has an adjustable suction valve & an easy to access a 20mm hose connection. This hand-sanding tool 80 x 230mm is an optimised size for putty sanding, less risks for tilt over when used. The 55 holes in the plate ensures effective dust removal. For more than three decades Mirka has been a leading manufacturer & supplier of abrasives to the automotive industry, automotive refinishing, composite manufacturers, the wood & furniture industries as well as the metal finishing industries. They specialise in coated, non-woven & dust-free sanding products for surface finishing. The unique Mirka concept of dust-free sanding, combined with our effective surface finishing solutions has replaced traditional sanding methods in many industries.